She’s written children's books about Jason the penguin and Barry the reindeer, young adult books about dogs, the afterlife, soldiers, and netball players. The first in the 'Unlikely Soldiers' series is set in nineteen seventies Britain. The second covers the early eighties and includes the Falklands War, service in Northern Ireland and (the former) West Germany. 'Friends and Revenge' is the third in the series, and takes a sinister turn of events. 'Court Out (A Netball Girls' Drama)' is Deb's latest standalone novel. Using netball as an escape from her miserable home life, Marsha Lawson is desperate to keep the past buried and to forge a brighter future. But she’s not the only one with secrets. When two players want revenge, a Tsunami of emotions is released at a tournament leaving destruction in its wake. 'Beyond Possession', book four in the Afterlife series is a fast-paced supernatural thriller involving child possessions, reincarnations and telepathic twins, with angels trying to keep the Devil and his evils at bay. ‘The Island Dog Squad’ novellas are inspired by Deb and Allan's rescue dog . The real Sandy is a sensitive soul, not like her fictional namesake. The other characters are based on Sandy’s real-life mates. Deb spends her time writing, avoiding housework and playing tour guide. For a free book or more information visit www.debmcewansbooksandblogs.com. Sandy’s Story is the first book in The Island Dog Squad series, written by Deb McEwan. The tale unfolds as a dog named Sandy (aka Fish), having lived through untold horrors and been rescued when near-dead and suffering from amnesia, takes us through her before and after story. Taken to a shelter and nursed back to health over the period of six months, Sandy is finally adopted by a loving couple, but suffers from night terrors as she sleeps and inexplicable reactions to simple things when she is awake. After meeting two dogs who seem to know Sandy by another name, Sandy slowly regains the traumatic and terrifying memories of a life which had led her to where she is today. As somebody who not only suffers from Post-Traumatic Stress Disorder and who dedicates her life to caring for animals, I could not resist grabbing Deb McEwan’s incredible canine tale from the shelf. Sandy’s Story shows the painful truth in not only Sandy’s life of past abuse, but also the lives of her dearest canine friends, Lola (aka Bunty) and Obie (aka Digger). As Sandy’s nightmares trigger memories of her brutal past, other realities are brought to the forefront, such as the circumstances of how Lola and Obie had originally entered Sandy’s life through abuse and mistreatment at the hands of others. Some instances of Sandy’s Story left me weeping, as I could not stop shaking while thinking of the hell that Sandy had gone through at the hands of people who gain enjoyment from hurting and killing animals. One of the most beautiful and heartwarming aspects of this tale is that it shows Sandy going from a dog that flinches at the slightest touch and ponders all possible horrendous endings to each day that she lives, into one that feels loved, adored and cherished by her new human family. I have nothing but the highest of praises to sing for this thought-provoking, tear-jerking tale of torture, death, hope and survival, and the strength it takes in order to come through such ordeals knowing that you are better and stronger for becoming the survivor that you are. I wholeheartedly recommend Sandy’s Tale to mature readers aged 15 and over who have animal welfare at the forefront of their mind every day, and who would do whatever it takes to save an animal from pain and suffering. In Sandy's Story: The Island Dog Squad, Book 1 by Deb McEwan, Sandy does not have long left to live when she is finally rescued by kind and caring humans. She slips in and out of consciousness until she awakens in what we all know as a pound. Because our beloved narrator is actually a dog. And through the eyes of this dog, you will gain a new vantage point of life, loss, betrayal, and adventure. She will discover a new family, make new dog friends, and uncover her past one piece at a time. Deb McEwan brings a sense of human emotion to man's best friend in a way that has rarely, if ever, been done before. I think every dog owner deep down believes their pet is its own sentient being that speaks to them. I know I've had my fair share of late night conversations with my own pup. So for Deb McEwan to actually tell a story through the eyes of a dog is both exciting and creative. Scenes that would have been commonplace in other stories take on new life as we see them from a completely different perspective than is found anywhere else in modern literature. This is the beginning of The Island Dog Squad series, and I'm already invested in reading more. I could see this being a popular addition to any bookstore or home shelf. A creative cover and some dog-friendly book readings and you have a winner in Sandy's Story. Sandy's Story: The Island Dog Squad, Book 1 is an animal action and adventure novella written by Deb McEwan. Something about the woman’s voice and gentle touch quieted Sandy’s normal flight response to human contact. Her name, it seemed, was Shel, and Sandy instinctively knew she could trust Shel, even as she finally collapsed from too many days without food and rest. When Sandy woke again, a doctor was examining her. She growled when he injected her with something, and then fell back asleep. When she awoke again, she was in a bed, and the old worn blankets that padded it helped somewhat to allay the fears she felt on hearing all the barking around her and wondering where she was. She noticed another dog was sharing the concrete pen she found herself in. She was smaller than Sandy and had black fur, and when a woman came by bearing bowls of food, the little one barked and leapt frantically at her. Sandy was happy for the food and loved the fact that the woman knew exactly where to scratch her head, but it was mostly about the food at that point. 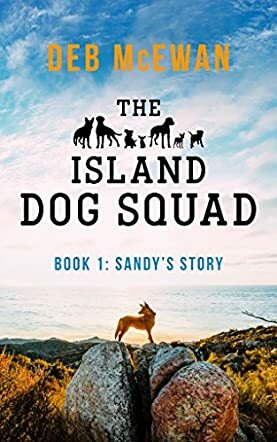 Deb McEwan’s animal action and adventure novella, Sandy's Story: The Island Dog Squad, Book 1, is a well-written and moving story told from a rescue dog’s perspective. McEwan’s tale shares insights into what it must be like for dogs getting adopted and being all too aware that they could easily get in trouble without even realizing it, and fearing, above all, being brought back to the shelter. I felt for Sandy after her new family neglected to give her time outside to perform her bodily functions, and loved seeing how she sensed the moods of her new family members. McEwan also brings up the issue of memory, and the problems rescue dogs may have in learning to trust humans again. Anyone who’s had the privilege of sharing their lives with an animal companion will love Sandy’s story, and those who are considering adopting a pet will benefit from this insightful and perceptive tale. Sandy's Story: The Island Dog Squad, Book 1 is most highly recommended. This is a story for dog lovers and young readers 10+. At times it is comical but then heartwrenching. Sandy is a rescue dog, the poor thing found almost drown as a puppy but luckily discovered at just the right time and taken in by military personnel. Sandy as a young dog endures some horrendous experiences, and ends up losing her memory. Happily she is taken in by a wonderful couple Ellie and Ben. Slowly her memory returns but along with it come terrible nightmares of a past life. Hence the story is not for the faint hearted. The story will keep you on the edge of your seat, and make you marvel at how clever Sandy is.